Our machines give us the ability to endulge in larger work than many shops can handle. Our experienced professionals also bring the best in experience to tackle the toughest jobs. 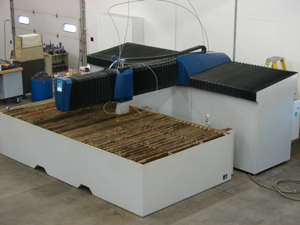 Flow 6012 Waterjet: 87,000 psi output, HD material support system,Travels 144" X-axis, 78, Y-axis, 12" Z-axis, Flowmaster control including Flow Path, Flow Cut, Flow Nest and Raster to Vector. 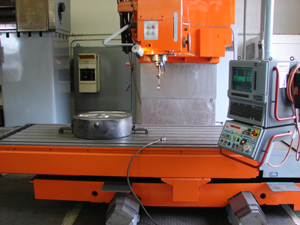 Droop & Rein SKE 130: Travels 90" X-axis, 47" Y-axis, 39" Z-axis, Fidia M2 control, 3000 RPM. Tarus CNC Finisher: Travels 78" X-axis, 59" Y-axis, 36" Z-axis, TPI-2000 control, 8000 RPM. Hurco MD3: Travels 41" X-axis, 18" Y-axis, 20" Z-axis, Ultimax control, 4000 RPM. Contact Us | Home | About Us | � 2009, Whatever You Need Now Inc.